Do you run, hike, have foot issues, or spent a lot of time on your feet? Do you suffer through aches and pain, blisters, flat feet, or plantar fasciitis? If you can answer yes to even one of these questions, then you should probably be wearing insoles and inserts on a daily basis. Most shoes and boots – even many high-quality brand names – come with mediocre stock insoles. That’s because not everyone needs to use high-quality aftermarket inserts. 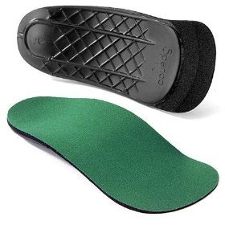 But for those of us who do, who have foot problems or spend a lot of time standing and walking, investing in a pair of comfortable support-providing shoe insoles – whether its the best arch support insoles, the best insoles for flat feet, or the best insoles for plantar fasciitis – can be one of the best decision ever made for such a small price. Why Do You Need Insoles? We’ve seen some great insoles and inserts produced over the past few years, and so far 2018 has proven no different. There have been a ton of great new products – and improved versions of existing products – that have come to market this year. If you’re searching for the newest, hottest shoe inserts, this is where to look. If you suffer from flat feet – also commonly referred to as fallen arches – you know exactly how important a quality pair of shoe insoles are. Without them, simply walking around the house can be a painful process. Equipping your shoes with the right pair of insoles and inserts, however, can alleviate much of the pain caused the insufficient arch support common with most brands of footwear. There’s no doubt about it: plantar fasciitis is one of the most painful and frustrating foot health issues out there. If you wake up every day with foot pain, or drudge through the day with a sharp discomfort in your heel, you could very well have plantar fasciitis – inflammation of your plantar fascia, the ligaments which run along the length of the foot from your heels to your toes. Buying shoes specifically made for plantar fasciitis can be expensive (not to mention the fact that most of them look horrendous), but luckily, a good pair of inserts can give ordinary shoes the comfort, support, and relief found in their their much more costly medical-shoe counterparts. Most people who are accustomed to wearing work boots on a daily basis are also used to dealing with some of the toughest, most active, and most physically demanding tasks out there. When you’re on the job first thing in the morning, you can’t afford to have your foot issues slowing your down. Regrettably though, the insoles and inserts that come in most brands of work boots just aren’t sufficient enough to meet the needs of many of their wearers. And buying a high-end pair of boots – that’s just going to get ruined anyways – can cost many hundreds of dollars. Thankfully though, there are plenty of great insoles and inserts which offer the same high level of all-day comfort at just a tiny fraction of the price. 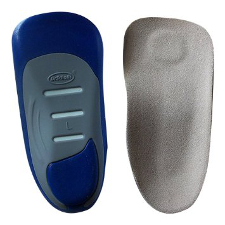 When you’re dealing with arch issues, you had better make sure that you’re wearing a pair of aftermarket insoles that provides the arch support – and full foot support – that your body needs. Failing to properly protect your arches with the best arch support insoles you can find can lead to constant discomfort and foot pain. Rather than settling for cheap insoles and inserts which simply prop your arches up, you want to be on the lookout for a fully-supportive set of insoles which work to stimulate your arch muscles. 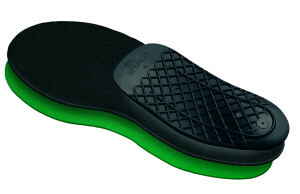 This allow your feet to carry your weight more naturally, rather than just pressing it all down on your insoles. Spenco Arch Supports were designed specifically to help control the position of your feet while providing the extra support needed to ensure stabilization and balance. They use a proprietary form of cushioning to provide better shock absorption than standard insoles and inserts, as well as to reduce the amount of friction created within the shoe – leading to a greater level of overall comfort for your feet. Every pair of Spenco Arch Supports come with a one-year, unconditional warranty – further proof that they are built to last. 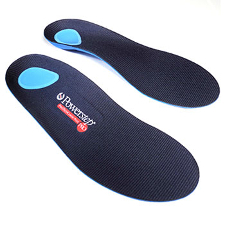 If you put a lot of pressure on the outside edges of your feet, the Powerstep ProTech Full Length are an amazing pair of quality inserts which will provide the same level of comfort and relief of insoles that cost more than twice as much. Commonly sold by podiatrists to help with a wide range of foot health issues, the ProTech Full Length from Powerstep provides some of the best arch support – and are among the most durable – of any of the high-end custom inserts on the market. 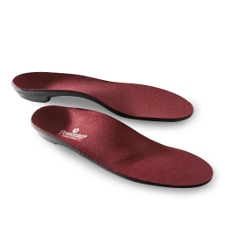 Another great set of insoles from Powerstep, the Pinnacle Maxx inserts were designed with the company’s patented Heel Secure Comfort System, a uniquely cushioning design which provides extra heel support through a deeper cut, expansive platform, and mild angling. 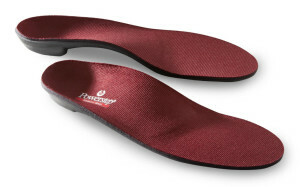 An improvement on their classic Original Insoles, the Powerstep Pinnacle Maxx inserts provide medical-quality control over your heels and arches. 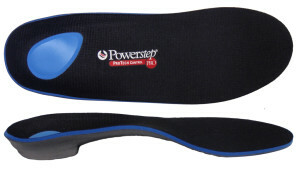 In studies, the Powerstep Pinnacle Maxx have been shown to help relieve not only foot pain, but also discomfort in the ankles, knees, and lower back. Perfect for anyone who leads an active lifestyle – whether it’s running, sports, or simply work that keeps you on your feet a lot – the Spenco Polysorb Cross Trainer insoles provide some of the best shock absorption and energy control of any new insoles and inserts out there. With extra cushioning in the forefeet and heels, these are a great pair of inserts for just about any foot problems. One of the unique features of the Polysorb Cross Trainer is Spenco’s patented Spencore technology which offers a 5/32” layer of extreme shock-absorption and impact cushioning for maximum long-term comfort. 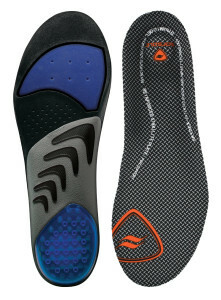 Designed for runners and anyone else who requires a high level of shock absorption out of their insoles, the Sof Sole Airr inserts are extremely lightweight, yet they still manage to provide a high level of support and cushioning that’s on par with even the bestselling and most popular brands. 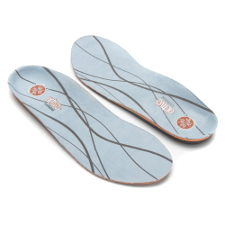 The secret to the Sof Sole Airr insoles is their use of an encapsulated air chamber in the heel and arch areas, as well as a unique polymer gel for extra cushioning in the forefoot. They also utilize a hydrologic moisture management system to ensure that your feet stay dry and odor-free, no matter how long or hard you’re using them. As one of the most common and bestselling brands of shoe insoles and inserts, pretty much everyone is familiar with Dr. Scholl’s. If you’ve never used a pair of their inserts, you’ve probably at least seen them on the store shelves. But what you may not know is that for their price, they are actually some of the best inserts out there. 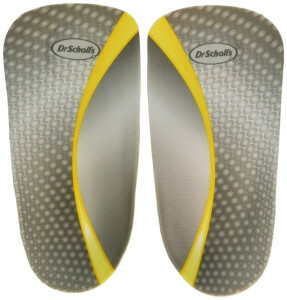 While they may not compare to some of the truly high-end aftermarket insoles, Dr. Scholl’s Custom Fit Orthotic Inserts are a smart buy for anyone who needs foot pain relief on a budget. Another plus: since Dr. Scholl’s is such a large company, they have a wide selection of different orthotic inserts to choose from. 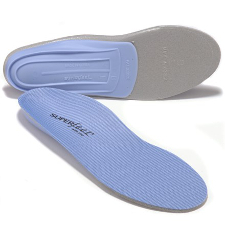 If you’re looking for a true high-quality pair of insoles and inserts for your shoes, the Superfeet Blue Premium Insoles should be at the top of your list. 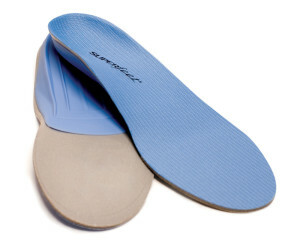 Perfect for all sorts of foot pain, including heel pain, arch pain, and plantar fasciitis, the Blue Premium Insoles fit almost all types of footwear for extra comfort, support, and relief from your frustrating foot issues. The Superfeet Blue Premium Insoles are covered with the all-natural latex-free NXT coating which provides maximum support against bacteria growth and foot odor. 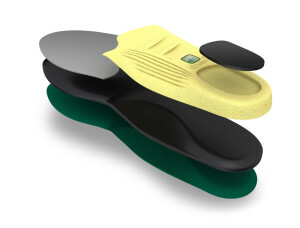 Long known for producing high-quality orthotic footwear, Orthaheel’s venture into the insoles and inserts market with the Orthaheel Active Inserts has been met with huge popularity across the board, both from foot pain sufferers and podiatrists alike. The Orthaheel active inserts keep your heels elevated with their slight 4-degree rearfoot wedge, contoured heel and arch, and cushioned shock dot. 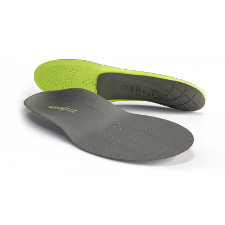 Ideal for anyone with planar fasciitis, especially those who are highly active, these insoles are tops for their pain relief and comfort. 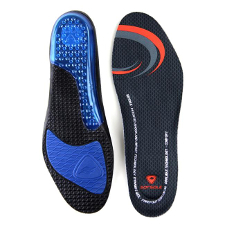 Developed out of a proprietary combination of ultralight foam and carbon fibers named Evolyte, the Superfeet Carbon Premium Pain Relief Insoles are often considered the best of the best for anyone seeking a super lightweight-yet-effective solution to their foot pain problems. Extremely popular among runners who prefer the lightest footwear possible, the Superfeet Carbon line of shoe inserts reduces weight, improves breathability, absorbs impact shock, and stabilizes the feet for long-lasting relief from chronic aches and pain for even the most active of wearers. 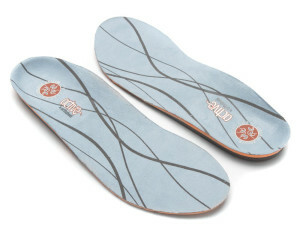 Insoles are the part of a shoe which provide the cushioning and support for the foot. Pretty much all types of footwear come with built-in insoles, but for many people, these stock inserts just don’t cut it. They’re typically made of a sub-standard quality – even in the best brands of shoes and boots – and don’t provide adequate relief for anyone who is on their feet a lot or who suffers from chronic foot problems like fallen arches and plantar fasciitis. 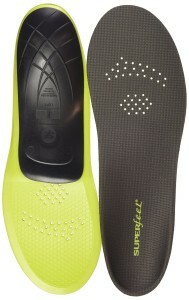 As a result, many people opt to invest in a good pair of aftermarket insoles. These high-quality performance insoles and inserts are designed specifically with the needs of the high-intensity wearer in mind. For anyone who runs or plays sports, and puts their feet through a lot of heavy-impact movement, upgraded inserts are a must. And if you spend most of your time standing or walking, you know exactly how uncomfortable non-cushioned insoles can leave your feet feeling after a long day. Extra Cushioning – Even if you have never dealt with foot pain in the slightest, if you spend a lot of time on your feet or put them through high-impact activities like running, you can probably benefit from the extra cushioning and shock absorption provided by a quality pair of insoles. Short-Term Relief – When you first start experiencing foot pain, many podiatrists recommend picking up a pair of inserts to provide short-term relief and give your body the support it needs to try and repair itself. Oftentimes, if you can catch your foot problems early, you can take the necessary steps to rectify the situation and prevent the issue from becoming more severe and long-lasting. Fix a Problem – If you’ve already developed fallen arches, plantar fasciitis, or any range of other foot-related issues, insoles and inserts are a definite must. When you’re living with foot pain, it’s not going to go away on its own. And if you’re not wearing shoes and boots which are specifically designed to address your issues, you are only making your foot problems worse. 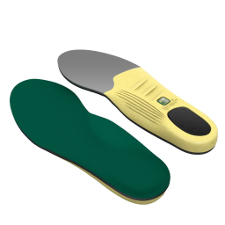 Luckily, quality aftermarket insoles provide an affordable solution that works with nearly any type of footwear. Prevent Future Issues – There’s no better time than now to get started taking care of your feet. They do a lot for you, and if you’re not properly caring for them now, don’t be surprised if they start giving you trouble down the road. That’s why most foot care professionals strongly urge their patients to start waiting upgraded shoe insoles and inserts as early as possible, to make sure that their feet, ankles, knees, and legs last them for a long time to come.